Yesterday, I showed some of my students a little card magic I learned in the waybackwhen, the summer I worked in a carnival. I’ll tell you that story sometime. One reason I did this is simple: magic is exactly like combat. Combat relies on capturing your opponent’s mind, too. You trap your opponent’s mind using a combination of suggestion, distraction, diversion, subterfuge, subtle deception, and outrageous lies. You baffle and bewilder them by making them think that they “see” things that they are not really seeing. And because they “see with their own eyes,” you make them believe – even if just for a moment -- things that are not true. And a moment is all you need. A lot can happen in a moment. The importance of this principle cannot possibly be over-stated. 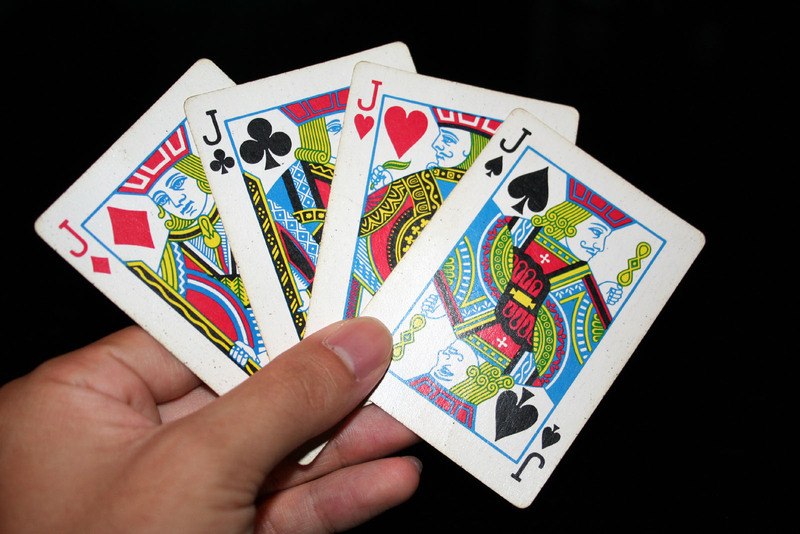 We know that playing cards do not change, do not move around on their own. It’s IMPOSSIBLE. Therefore, you can trace the illusion back, step by step. When did it APPEAR that the cards changed? 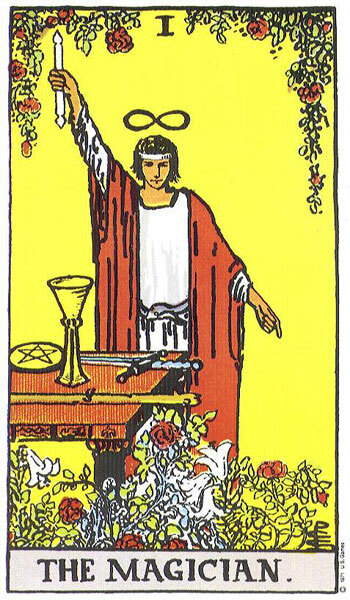 When and where did you last actually see the card? What happened after that? Clearly, what you thought you saw was really something else. Step by step. Question each one. Verify what you think you know and HOW you know it. Verify what you think you saw – did you actually SEE “X”, or did you conclude that you saw “X” because of some assumption, or suggestion? In both magic and combat, you use your opponent’s assumptions, beliefs, habits, and responses against him. Because you know that your mark responds to “A” with “B,” you can anticipate “B” and be ready to do “C.” See? Let’s put it in fencing terms. Let’s say “A” is the attack, the initial offensive action. If you understand the nature of your opponent’s attack, you can counter-attack, make an offensive action DURING the attack. An opponent who is committed to an attack is in a very poor position to defend and so a properly chosen and executed counter-attack has a very high probability of success. Counter-attacks are good. I love them. It’s foolish to put all your eggs in the attack basket. It’s a habit of beginners and very poor “fencers.” They try to attack harder, faster, and deeper so that their opponent doesn’t have a chance to do the counterattack, or that the counter-attack will miss, or be a hair too late, and in the artificial context of a fencing contest, the “rules” will save the attacker’s life. But there are no such rules in a fight. The attacker must save himself. People are good at what they like and like what they’re good at, and tend to do it whenever they can. If I can determine that my opponent is so inclined to counter-attack, I won’t try to keep him from doing it. I’ll let him do what he wants to do. Hell, I’ll ENCOURAGE him to do what he wants to do. I’ll create the appearance of an opportunity to do it that he can’t resist, because he thinks I’m making a mistake. 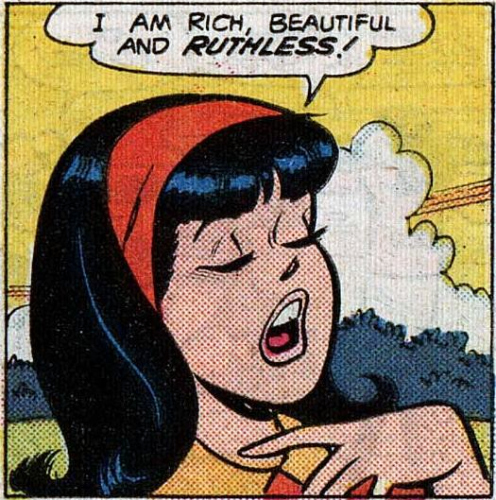 And then I’ll use it against him. For example, I “attack” with my swordarm bent and my high outside line slightly open. This invites my opponent to counterattack with opposition to that line. I telegraph my intention, and contrive the speed of my attack to enable him to “pick me off” with a fast thrust. As he makes that thrust, I parry, and then continue my forward movement with a riposte with opposition to guard against a remise of his counterattack (getting inside his point if I can). We use the term contre-temps or “counter-time” is used to describe every action made by the attacker against the defender’s counterattack. If my opponent is skillful, he will not walk into the same ambush again. If he is skillful, he will understand the nature of my contre-temps and will either deceive my parry, or parry my riposte and make a counter-riposte. We use the term fenta di tempo, or feint in time, to describe every action made by the defender against the attacker’s contre-temp. Let me break it down for you another way. Suppose we’re having a fencing contest. If you try to parry my attack, one of two things will happen: either you will find my blade, or you will not find my blade. If you do not find my blade, it’s because I have deceived your parry. Deceiving your parry is my Plan B. But suppose I try to deceive your parry, and I fail. You find my blade. One of two things will happen: either you will make a riposte, or you will not make a riposte. If you do not make a riposte, I will make a remise and hit you. That remise is my Plan C.
If you DO make a riposte, I will parry and counter-riposte. One of two things will happen: either I find you blade with my parry, or I don’t. If I find the blade, I will execute my counter-riposte. That simple parry and counter-riposte is my Plan D.
If I do NOT find your blade with my parry, it’s because you have deceived my parry. If I do not find your blade with my parry, I will give a little ground (if necessary) and execute a second parry and find your blade with that one, and counter-riposte. That compound parry and counter-riposte is my Plan E.
Are you beginning to see a pattern? Anytime you make a plan, you have to ask yourself, “What could go wrong?” at each step of the plan, and have a back-up plan for each eventuality. I don’t even put my pants on without a Plan B. Just for fun, here are some films I strongly recommend. They’re good films and I think you’ll enjoy them. But they aren’t “just entertainment.” Each of these films is about illusions, distractions, ambushes, understanding the nature of the opponent’s probable response, plans and back-up plans. 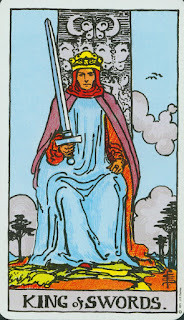 The sword, used alone, as Capo Ferro said, is the queen of weapons. There’s not much point in trying to use TWO weapons, if you’re not capable of using ONE. That said, I have two hands. Would I use only ONE of them in a fight? When it’s a fight, and not an “athletic contest,” there are no rules, and you use whatever you have available. That includes both hands and both feet. And it doesn’t hurt to use your head a little, either. Back in the day, most everyone carried a dagger as an all-purpose tool, and of course, some were made en suite with rapiers. Whether it’s a dagger, a cloak, your scabbard, a wine bottle, or chair leg in your left hand, or just your empty hand, it pays to think past the solo sword. 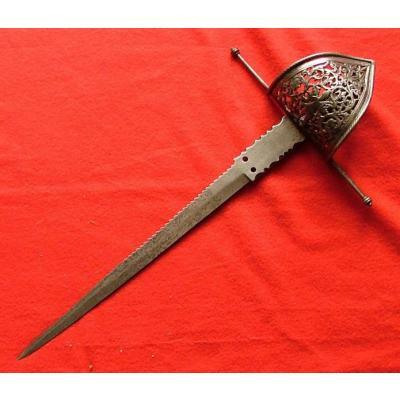 As our exemplar of the left hand, let’s use the dagger as our left-hand weapon because so many fancy themselves “rapier and dagger” fighters, and so few are correct. The dagger has several functions. 1. Preparations. The dagger can be used to engage, beat, press or trap your opponent’s blade in order to facilitate your attack with the sword. 3. Opposition. The dagger can be used to apply opposition to your opponent’s blade. Opposition may be the most critical of all these uses. Having parried your opponent’s attack, you oppose his weapon with your dagger while you make your riposte. I’m a great believer in controlling the opponent’s weapon at all times, keeping it where I want it, not where my opponent wants it. Parries are the second best use of the dagger. This allows you to execute your parry and riposte simultaneously rather than consecutively. Indeed, you could say that you’re now executing a counter-attack with opposition rather than a riposte. Because the counter-attack happens during the opponent’s attack, and because it’s very difficult for your opponent to go forward and backward at the same time, your counter-attack is extremely difficult to defend against – unless, of course the attack itself was a ruse to draw your counter-attack, in the hope of a contre-temps. 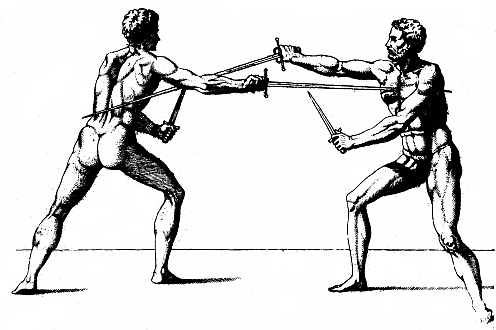 While the dagger can be used alone to parry, it can also be combined with the rapier to effect a “double” parry or “crossed” parry. In this use, you surrender the simultaneity of the parry and the riposte, but you gain opposition with the dagger, freeing the rapier to do its work. Preparations. Never make a frontal assault against a fortified position unless you have already neutralized your opponent’s offensive capability. That’s the job of the preparation. The dagger occupies your opponent’s sword so that you may attack. Often, the preparation is combined with opposition. Offensive actions. While seizing your opponent’s sword with your own sword, you can close the distance and strike with the dagger. Against a same-handed opponent, you close and move to your dagger side, that is, to his (now) unprotected rapier side. This use doesn’t work as well against an opposite-handed fighter. The dagger is only useful for offense when at close quarters, as we’ve seen so many celluloid villains try to prove. Another good reason to control distance, and keep your opponent on the end of your point. It’s possible to throw your dagger, but unless you’ve developed that skill in particular, forget about it. It might as well be a crescent wrench. Even folks who throw a knife pretty well, generally don’t throw it well with their non-dominant hand. Then too, if your opponent didn’t have a dagger of his own, you may just have provided him with one. You can use your empty left hand in much the same way, even for offensive actions – though personally, I’d use my elbow to strike with and not my hand. Some people balk at using the naked hand for fear of getting it cut, to which I reply with the very first rule of fighting which states: You’re going to get hurt. A cut to the hand, or a thrust to your heart? I leave the choice to you. A bottle, preferably broken, or any blunt instrument can be similarly employed. A cloak, coat, or blanket is good, too. Wrap it around your left hand and forearm to provide some protection. Some people have said that you should hold it loosely, and flail it around like a matador, but I personally find that more awkward than helpful, though, lord knows, there’s nothing like a good veronica. As always, it’s important to know the difference between a “fencing match” (an athletic contest with specific rules) and a fight, and to know which one it is that you’re doing at the moment. When you’re in a contest with a weapon, you use the weapon. When you’re in a fight, you ARE the weapon. Imagine if swimming suddenly started to be practiced on dry land. After all, it’s certainly SAFER than practicing in the water. You can still do the arm movements, do the head movements, coordinate your breathing. You can’t really kick very well, but you can walk-in-place to simulate doing something with your legs. It’s particularly good for people who are afraid of the water. You could even have contests and give prizes to the best dry-land “swimmers.” Medals. Trophies. Glitz and glamour. Hell, let’s make it an Olympic sport. At first, dry-land “swimming” might simulate swimming in water insofar as possible, but with time -- and without water -- some people start “gaming” the rules. Since they have no commitment to swimming in water --- because they never intend to actually do so – they start looking for short cuts, trimming corners, doing things in such an incorrect manner, that, if done in the water, they would most certainly drown. But on land, with no risk of drowning -- with no real world "feedback" --- people could indulge in all sorts of such suicidal antics and call it "swimming." Somewhere along the line, some bright mind might point out that the swimming done on dry land seems to have lost a certain je ne sais quoit, but I don’t know what. To rediscover the lost art of true swimming, this innovator pours over the dusty texts of the “great swimming masters” and as a result of this exhaustive research, has his swimmers not only copy as closely as possible the postures depicted in these books, but also has his “swimmers” stand in a shallow trough of water, and, to polish it off, gives them a good hosing. Certain that he has captured the “essence” of swimming, he has no idea that it’s --- shall we say a “watered-down” version – that still bears little resemblance to the swimming done in water. Of course, there are one or two people who don’t “go along to get along” with the popular trend. They look at dry-land swimming and immediately recognize that the emperor has no speedos. These folks continue to swim in water as they’ve always done --- not just in pools, but also in lakes and rivers and even the ocean! And these miscreants pass the practice on to others – young people who then waste their time swimming in water when they could be swimming on dry land like everyone else and win fame and fortune, scholarships, “Olympic gold,” and a chance to write a memoir about how dry-land swimming changed their lives, gave them self-esteem, took them out of poverty, introduced them to the Meaning of Life. It seems quite unreasonable to the modern-sport dry-land swimmers, that the last practitioners of the old style of swimming in water, refuse to accept dry-land swimming as a “valid” swimming style. After all, both are just variations of the same “art” and with no “objective” way to measure that one is any more “valid” than the other. Does this little swimming scenario seem absurdly impossible? Oh, how I wish it were. Insert a long, weary sigh here. Sadly, over the last 25 years or so, fencing has devolved into something that is quite the opposite of what it once was. It is no longer based on the intelligent use of the sword in a real “encounter,” indeed has lost all verisimilitude to sword fighting. The rules, once based on the realities of combat, have been “interpreted” until they mean precisely the opposite of what they once meant, in quite Orwellian fashion. “Fencing” is now nothing more than a contrived game, like baseball, with rules that are arbitrary and capricious. There is no longer any sense, any logic, or truth to it. 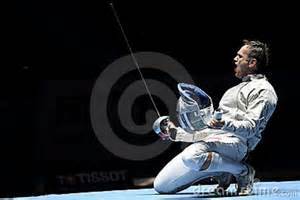 Even worse, while fencers were once famous for their refined, composed and courteous conduct, they now make a grand show of pique, displaying narcissistic fits of temper, screaming, crying, celebration and so on. Had they any character at all, they’d be embarrassed by these infantile outbursts. Apparently, they do not. The very term “fencing” like the activity itself, has been misused, debased and degraded until it retains none of its former connotations. I sincerely regret having coined these terms for two reasons. First, I regret it because subsequently the term “classical fencing” was gradually adopted by a lot of folks who had no idea what I meant by the term, and didn’t much care. Some defined it as simply fencing without the electrical scoring apparatus. (In truth it’s perfectly possible to fence classically WITH the electrical scoring apparatus. I, and many, many others, did it for decades.) Others made it a form of “historical re-enactment” by claiming it was a “style” of fencing popular in the 19th century, rendering it, thereby, nothing more than a snapshot of arbitrary and frivolous fashion. These folks even copied the attire of that past time, thinking that made them more “classical,” in the same way that playing 3-chord rock and roll might become “classical” music if only you wore a white powdered wig while playing it. 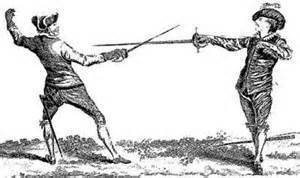 "Classical fencing" became a term that meant whatever the user wanted it to mean. In truth, I took the term “classical” from music. The Harvard Music Dictionary gives this description: (classical music) strives toward a particular ideal of "poise, balance, proportion, simplicity, formal discipline, craftsmanship, and universal and objective (rather than idiosyncratic and subjective) expression," affording us a "standard or model of excellence that has enduring value." -Steve McQueen as "Vin" in "The Magnificent Seven"
The other reason I regret using “Olympic” and “classical” fencing, is that these terms suggest that “classical fencing” and “Olympic fencing” simply distinguish two variations on a theme, two equally legitimate “styles” of fencing, like two different flavors of ice cream. The distinction is, rather, between ice cream and manure. At the time, most good fencers simply referred to that which would become acceptable as “Olympic fencing,” as “poor” or “incorrect” fencing, as “blade bashing,” and “poke and hope.” I should have stuck with that, and I wish I had. But, at the time, I had many acquaintances, some of whom I rather liked, personally, who were involved in the increasingly flawed fashion taking over the sport. These were folks who wanted to make a living “coaching” fencing at the high school or college level, and who were in no position to buck the system. They weren’t the ones who changed the rules; most of them didn’t even like the rule changes. But it was “out of their hands.” They had to “go along to get along,” to get and keep a coaching job with employers who knew and cared about nothing but the won/lost tally at the end of the season. Because of my emotional connection to some of these people, I made a very bad mistake: I decided to sugarcoat the truth, to avoid hurting their feelings and to avoid estranging myself from them. It was a very poor choice on my part. It was a very cowardly choice. But I was young, and if nothing else, it taught me a very valuable, if very painful, lesson: a bitter truth is better than a sweet lie. As a result, I resolved never to make that kind of error again. To be fair, at the time, I did not foresee how far from the Truth of the sword the sport of fencing would veer. I did not understand how ridiculously contradictory to reality and combat logic “Olympic” fencing would become. I did not anticipate such a complete abandonment and then reversal of every principle that had ever been a part of the sword, either as practical self-defense, or as healthy exercise for the bodies, minds and character of ladies and gentlemen. We have therefore decided to discontinue using the term “fencing” as much as possible. Even “classical fencing” is inappropriate and inadequate because of those numerous self-styled “classical” fencers who have misappropriated and co-opted the term for their own misuses. Unfortunately, it’s probably too late to trademark “classical fencing” and redeem it. We may yet try. However, in the general, we will preferentially use the following terms. Behavioral Hoplology is the study of human behavior in combat. This broad term encompasses all manner of fighting, real and ritual, serious and symbolic. Swordfighting. That’s what “fencing” is and it’s about as simple and clear a term as I can imagine for fighting using a sword. Swordmastery. Refers to the discipline of the sword, the martial art of swordfighting and all that it entails and requires of body, mind and spirit. Swordman./Swordmanship This is a word that indicates the indivisible unity of the sword and the human being. In this usage it is gender neutral. 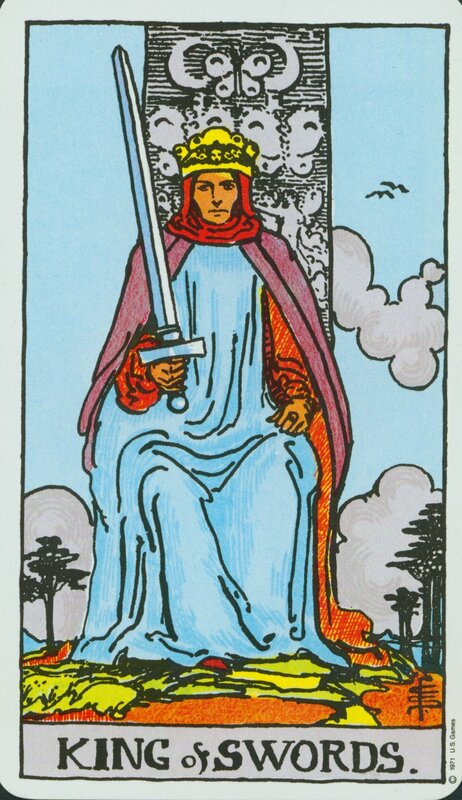 It means “one whose consciousness is manifested with, in and through the sword. While a fencer is one who merely uses a sword to “do fencing,” the swordman IS the sword. I consider this similar to the difference between “riding” and “horsemanship.” Riding only requires that you stay in the saddle. Horsemanship requires an intimate knowledge of, relationship with, and respect for the horse – and has practically NOTHING to do with riding, per se. I suppose we’d better hurry and trademark these new terms before some idiot steals them, too, and claims that they refer to something involving aged cheese, fishnet stockings, and some kind of ball. It is axiomatic that you must never make a frontal assault against a fortified position unless you have already neutralized your opponent’s offensive capabilities. It is also axiomatic that a fighter who is centered cannot be hit. “Centered” means he is in a state of mental, physical, emotional and spiritual equilibrium. Assuming your opponent’s sword is situated between you and his body and in a manner that precludes your safely moving forward, that means you don’t make an attack unless you first take control of your opponent’s sword so it can’t hurt you. You may control his sword physically, mentally emotionally or spiritually. For the moment, we’ll just discuss physically. A preparation is an action intended to facilitate a subsequent initial offensive action. Theoretically, anything could be described as a “preparation,” from the stomp of a foot to the wink of an eye. 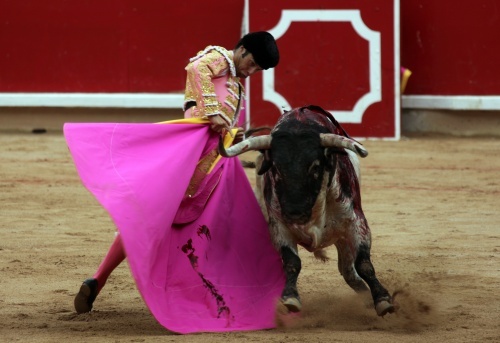 But in order to distinguish sword-fighting from flirtatious flamenco, we will limit the field somewhat. A preparation is simple when it occurs during a single unit of fencing time. It is compound when it occupies two or more units of fencing time. Quite often the preparation is combined with some manner of footwork to move onto attacking distance. It is also possible, but rarely advisable, to prepare by merely advancing. We’ll discuss that more when we consider the contre-temps. A preparation may open a line to direct attack, or it may open a line to indirect attack. The best preparations give your opponent an option of two possible actions, either of which will result in his being hit. a. You advance and engage in 6te. Your opponent yields the line to your engagement. You execute a straight attack with opposition in the same line. b. You advance and engage 6te. Your opponent closes the line. While he is closing the line, you execute a disengage attack with opposition in the opposite line. It’s the classic “Damned if you do, damned if you don’t” scenario. You can create the same sort of situation using a change of engagement, a beat, change-beat, press or change-press. Take note that I say “with opposition” in each case. It is axiomatic that you must always make opposition in the final line in order to protect yourself from your opponent’s reflexive, hail-Mary counter-attack. Opposition includes both the placement of your hilt and the angle of your blade. You can find your opponent’s blade in either the horizontal or vertical plane. That is ,you may attack your opponent’s blade from the left, the right, from above or below. Virtuosity with the sword requires that you be able to apply any type of preparation against your opponent’s blade in any line. NOTA BENE: that a preparation is not an offensive action. It precedes an offensive action. Offensive actions, by definition, have the capacity of inflicting a wound. No matter how hard you beat your opponent's blade, you will not inflict a wound on him thereby. The blade doesn't bleed. Some people seem to be quite confused about this, thinking of the preparation as part of the attack. Always remember that your objective is to hit without being hit. You must render your opponent unable, in the moment, to EITHER attack or defend. At the moment he is hit, he is effectively unarmed. But don't say that in court. Finally, never rely on, or make it a contest of size, strength or speed. Rely, instead, on physics, geometry, and science. This article, written by one of France's leading Fencing Masters, first appeared in the Feb-March 1983 issue of Escrime magazine and was later published in American Fencing magazine with whose gracious permission we re-print it here. During the time I studied with Maitre Jean-Jacques Gillet, 1977-1980, he was the head of the National Coaching staff. He fought fiercely for correct fencing technique and strict application of the rules. He believed that the proper role of the scoring apparatus was to assist the President du Combat, not to replace him/her. Some “coaches” would argue that “it turns on the light.” M. Gillet would simply respond “But it’s wrong and it’s stupid.” Battles against corruption and stupidity, you may notice, are seldom won. Everyone still remembers how the Soviet champion Vladimir Smirnov met his death last July , during the world championships in Rome. [Memory of this death has since long faded in much of the fencing world, if the incident is remembered at all.] Everything, or almost everything, has been written about that dramatic episode in fencing history. Curiously, however, the fencing masters were the most discreet in their appraisals. Raoul Clery has just filled in this blank by writing us a text with the double merit of offering new considerations and of emphasizing that a thorough reform of fencing is mandatory at all levels and in all categories: officials, masters, fencers, and directors. At the October 2, 1982 meeting of the governing committee, F.F.E. President Roland Boitelle opened the session by paying tribute to the Soviet fencer Smirnov, mortally wounded during a bout in the world's team foil championship. It was a highly merited tribute, as much by the champion who will leave the memory of an exceptional foilist: Olympic champion, winner of the World Cup, as by the man, whose dignity and conduct on and off the strip were exemplary. This tragic loss plunged the little world of fencing into consternation and fed the news reports on the sport for some time. People tried to understand what had happened, where the responsibilities lay, and how to avoid the recurrence of such happenings. People feared (though it is not established at this writing) that the horrible nature of the accident might have repercussions in our recruitment, especially among children. Some parents have, indeed, said that they had not thought such an accident possible. Let us reassure them at once. No such accident -- or even a less serious one -- has ever been recorded in the young children's categories. The reason for this [is] that the children have neither the body weight, nor the strength, nor the aggressive violence that we see more and more among adults. In this regrettable affair, one would have liked the French Academy of Arms to take a stand. There was nothing. However, in France, 500 fencing masters teach several thousand pupils each day. Above a certain level of competition, we fear the responsibility of the former and the safety of the latter are not fully assured. • The calf of the leg pierced through. It is really a joke to allow the protection of legs by... a pair of stockings! • A deep wound from a broken blade, just above the knee. 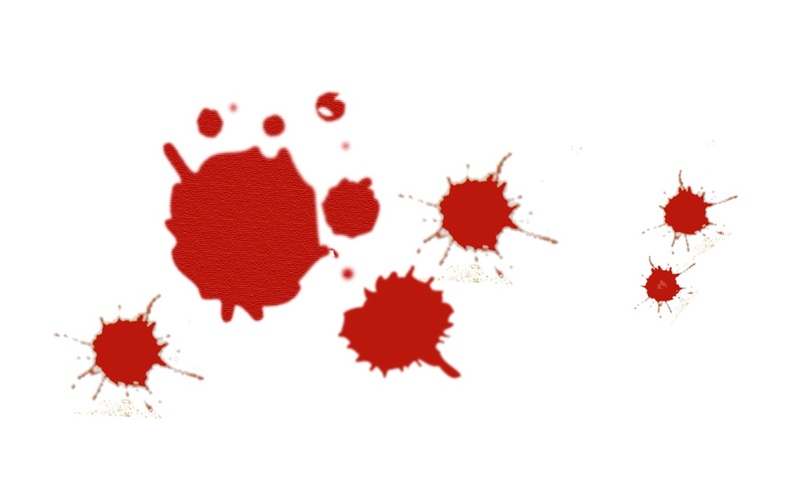 • A wound in the armpit, as far as the pleura, by a broken blade which penetrated jacket and underarm protector. • Finally, during an inter-regional foil championship: in the course of infighting, the weapon of one fencer broke; the broken piece penetrated the jacket collar of the opponent and went through the protective undergarment, grazing lightly -- fortunately -- the upper left portion of the thorax. • The Blade, of steel the same strength as five centuries ago, sometimes breaking at an angle and transforming the weapon into a dagger. • The Mask, of metal lattice-work, whose mesh can spread apart or break from a violent blow. • The orthopedic Grip, which will not let the hand release it in case of strong resistance. • The Directing, more and more lax in conventional weapons, letting fencers do anything, in any way. • And, in consequence, the very nature of modern fencing, oriented more and more toward physical contact and brutality than toward technical perfection. Let us review these various elements. Technically incompetent and suicidally aggressive. Double funeral. Its responsibility in accidents is undeniable. Above all, this is what makes fencing dangerous. Of breakable steel, fragile because of the too-weak portion of the tip, unpredictable either in its resistance or in the shape it will take at the instant of fracture. When it breaks at an angle, depending on the force of the thrust, it can penetrate all fabrics currently in use, as well as the mask -- as the accident of the unfortunate Smirnov demonstrated. The first idea that comes to mind is to find out whether the time has come to make modern blades heavier or to give them more "body" in order to increase their resistance. The power and speed of the contemporary champions, the evolution of their game toward greater and greater violence, are clearly superior to the strength of the equipment they use. This explains on one hand why accidents hardly ever happen among children and at the same time explains why they are becoming more and more frequent and serious among adults: the former are using equipment whose strength exceeds their own physical force; with the latter, their physical force dominates the equipment. Heavier blades would not break or would break less; the speed of the actions would be reduced; directing would be facilitated; it is even possible that fencing so practised [sic] would be cleaner, better technically. Obviously, such a reform would upset many preconceived ideas and taboos, from which modern fencing seems quite incapable of freeing itself. The second solution one thinks of is to find out whether some process could eliminate or at least reduce the power of a steel blade to penetrate at the instant of breaking. Since the accident, some have imagined that it might be possible to have at the base of the blade, near the guard, a sort of "pre-break" capable of releasing the entire blade when its flexibility exceeds a pre-determined threshhold [sic]. That is one solution, though we may still fear that the weak part of the blade near the point, might break at a lesser pressure than that set at the base. Thus, we must suppose that a blade would sometimes break into several pieces. Besides, we can wonder where the commercialization of such an item might lead, and what reactions -- justified or not -- it might provoke among the clientele. Another solution might consist in inventing a device allowing both parts of the blade not to separate at the moment of breaking, but to remain joined together and thus form a "plug" -- a little like the way fiber-glass blades break. This plug would considerably lessen the power of penetration; blows received under these conditions could no longer go through a mask, and they would be more like bruises than dagger thrusts. How to get this result? Perhaps by means of an "unbreakable" wire, soldered to the back of the blade in a groove like the one used for the electric wire. Not being a technician, I do not know whether this can be produced, nor what the cost might be. All the suggestions elicited have, above all, the object of trying to retain the use of the metal blade while eliminating the danger that it presents in itself, all while satisfying the taste of certain fencers who insist that only the "contact of steel" stirs within them "tactile," "visual" and, indeed, "auditory" sensations. That is a reflection that leaves us skeptical: on the one hand, because modern foil fencing -- with only a few exceptions (French) -- seems to us to rely more on articulation of the shoulder than upon that of the fingers; the role of sight has not much to do with the consciousness of steel; that of the ear can be considered as entirely negligible; and on the other hand, because everything is a matter of habit and adaptation. Fifty years ago, for example, all the tennis players in the world uniformly used racquets [sic] of wood, strung with cat-gut. Today, without wood being completely abandoned, nor cats on the road to extinction, they manufacture tennis racquets [sic] (as well as fishing poles, skies, ski-poles, etc.) of metal, of carbon fibre, or of glass/resin fibre, and the strings are sometimes nylon or sometimes altogether different. This evolution in equipment does not seem to have harmed the quality of the modern tennis champions, who have preserved all their "sensations" and their "touch." Then wouldn't it be possible, simply, to support a development of this sort, researching the manufacture of a blade of synthetic material, presenting the same qualities (weight, stiffness, suppleness) as the steel blade, without its drawbacks? Even if the production of such a blade were expensive, which is not certain, this expense should quickly be amortized it could last (as has been said) several years. Knowing that at present a competitive fencer breaks, year in, year out, an average (very approximate) of a dozen blades, this should not be, in average terms, too costly for the fencer. Everyone knows, too, in our profession, that, depending on the individuals and their personal styles, certain fencers break twice as many blades as other. Which corresponds exactly to the indication of danger they constitute on the fencing strip. In our salle, we prefer the use of the so-called “double-wide” epee blade, also known as the “musketeer” blade. Just as M. Clery notes, these blades slow down the pace, resulting in a greater degree of verisimilitude, clarifiy the phrase, AND are far less like to break under any circumstances. But they are stiff and receiving a touch is unpleasant. We make the accommodation by using more protective jackets and/or plastrons. It was the mask that let the broken blade reach the unfortunate Soviet fencer. Could it have stopped it? That is the question. A violent blow, after the breaking of the blade, can push apart or divide the mesh of the present-day mask, especially if it has already been weakened from sweating and wear. When one fences a lot and sweats abundantly, the mask can deteriorate quickly. In the big competitions, an equipment check is expected. We have no reason to doubt that this indeed took place under the conditions stated in the Rules (Art. 5 -- par. 27) with the aid of the spring punch. If this is the case, then we must agree that the thrust which went through Smirnov's mask exceeded in violence the norms and the pressure stated in the Rule. A daily paper published a photo of Smirnov's mask, clearly showing a round fresh hole about the level of the mouth, the mesh appearing neither pushed in or dented. 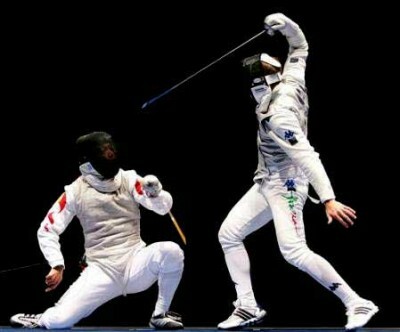 To produce such a clean break would require (if photo is authentic) that the continuing thrust be executed with prodigious force, or else that the speed of the forward movement of the one who received it (Smirnov) must have been very great, or that the two fencers must have been right in front of each other. These various observations lead us to think that the solidity of the mask today is insufficient to insure the safety of high-level fencers. And this is in the very element of its structure: the mesh. This is so true that before 1914 Maison Souzy had made a so-called rational mask, constructed of two perforated sheet-iron plates (one for the face, the other for the head and sides). Much stronger than the woven mask, the "rational" one perhaps had the inconvenience of being a bit heavier (and we know that fencers have always preferred lightness to safety), which increased sweating. Perhaps too, its price was too high? I was too young at the time to know. Anyway, I used a mask of that type for several years. I can certify that I tolerated it without any discomfort, and I was not the only one! I retain the private conviction that, with a mask of that kind, Smirnov would still be among us today. As for the plexiglass mask, made of "lexan" (motorcycle type) of American origin, we must try it before rejecting it. Why can cyclists endure it for several hours sometimes without discomfort, yet fencers would be traumatized after a few minutes? Annoyance provoked by lack of ventilation, by the steam of sweat? This problem must be studied more seriously than has yet been done. Besides, it is evident that if such a mask were ever adopted, the glances (visible) which the fencers might exchange would open up new sensations to them, not in progression of the opposing blade which is approaching but in the direction it is going to take and which the glance might betray. It is however possible that the plexiglass might more or less distort the image seen by the fencer and interfere with the exact judgement of distance, an absolutely indispensable notion for the fencer. One might not forget, in constructing a fencing mask, that it must, imperatively, protect the nape of the neck much more than present masks generally do. Most masks now are made of stronger, tighter mesh. We prefer the stainless steel versions because the are the strongest. Prior to 1980, I never saw anyone’s mask fly off in the middle of a phrase. I never even heard of it happening. A properly-fitted mask ought not to do that. I’m told, however, that during the irregular antics of current fencers, it has happened. For this reason, they now require an elastic strap to hold the mask on the fencer’s head. We prefer to see that the mask is properly fitted, and that the fencers fence correctly. Ugly, off-balance, and out of control,"poke and hope." The first measure we heard discussed following the Russian champion's accident was the banning of the orthopedic grip. This measure was demanded by the F.I.E. medical commission the very night of the accident. By returning to the straight (French) grip, they think the pressure of the hand (and of the arm) on the blade would be weaker at the moment of the touch, and that the said hand would be released more easily in case of a frontal shock and breaking of the blade. This is True! But the truth compels one to say that certain grave -- and even fatal -- accidents have happened (in three weapons) between fencers who did not use the orthopedic grip. More than 20 years ago, when the orthopedic grip began to florish [sic] in all the salles d'armes in France under the pretext that the electric blade did not have the same balance as the old blade, F.I.E. President Commandant Bontemps -- no man for half measure -- decided to prohibit its use by fencers under 20 years of age "except when medical certificate prescribes its necessity." He had to renounce this project quickly before the avalanche of medical certificates that piled up on his desk. Then freedom was left to everyone to use the grip of his choice, and we observe today that a very clear majority of fencers, in France and in the world, uses the orthopedic grip. To ban the grip, of whatever sort, seems excessive. It is not at all proven that the grip was at fault in Smirnov's accident. The grip makes the weapon, the weapon influences the style, and often determines the method or school. Formerly, the two fundamental schools of foil, Italian and French, founded their principles on the use of weapons of different structure. The Italian foil with crossbar, with a very short grip, requires holding the pommel against the wrist by means of a strap. There still exists caricatures of the illustrious knight Pini, at the end of the last century (at encounters with his French rivals Merignac and Prevost) carefully wrapping his wrist with a sort of ribbon of impressive length. To my knowledge, neither Eugenio Pini nor the great Italian fencers of the period preceding the last war, who used the Italian foil, ever killed anyone when they broke a blade. If I'm wrong, people will certainly let me know. And if that had happened, would they have banned the crossbar grip and destroyed the Italian school with the same stroke? It is not so much in the grip that we must intervene, but rather in the manner of execution, which has considerably evolved since electric scoring came into use. On this subject, it is with much interest that I read the declaration of Carlo Brusati, President F.I.E., regretting the nature of today's fencing: "heavy, without style, without standards (mesure), and the masters and teachers, contrary to what was done in (his) time, no longer require the primordal [sic] quality, that is, bringing the blade (toward the target) with suppleness." All this to say that it does not seem necessary -- even with an electric weapon -- to put considerable force into "carrying" a touch. One should be able to find among the great fencers of this end of the 20th century what one admires among their counterparts in tennis or among great pianists, an exceptional "touch". We are far from this! Fencing is neither boxing, nor wrestling, nor weight-lifting; one can be effective in it without being brutal. In case of mediocrity, it's not the grip -- whatever it may be -- that must be blamed, but the one who holds it and animates it. For that, perhaps we must rehabilitate the working of the fingers and the wrist, and the suppleness and relaxation of the arm, notions which passed into the background a quarter-century ago. 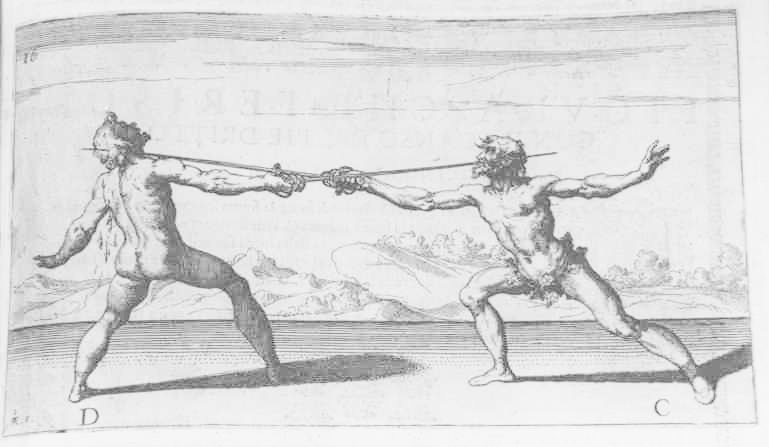 The combativeness of a fencer should rest on science and technique, not on violence. 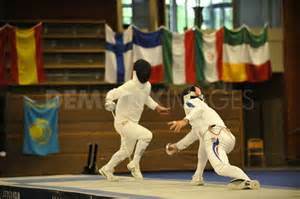 Do not confuse, either, the "physical condition" necessary to any competitor and the "physical force" which is not indispensable in fencing. Sometimes in the past they characterized the talent of the great masters by the expression, "hand of iron, arm of rubber." Perhaps later, to classify the fencing of our period, they will need to use the term "hand of steel, arm of concrete." We do not permit the use of the “orthopaedic” or “pistol” grip in our salle. Dangerous and just plain stupid. There is the habit, in sports, in the case of an incident, or alas! an accident, to blame the officiating. The accident of Smirnov was no exception to this rule. There were even harsh words with the directors after the world championships, but certain qualifications used were excessive. If a case is to be made on the matter, it must be about directing in general, rather than about particular directors. Let me explain. In whatever sport it may be, the rules of the game are set by an international governing body which defines them and explains them in order to make them known to all, and charges the officials to watch over their application. If something is wrong in the application, the international body has the imperative duty to convene the officials and to explain its thoughts on the disputed points, in order to arrive at a unity of doctrine. This is absolutely indispensable to trainers and instructors so that training and instruction may support each other and conform well to the texts. At present, in the absence of any reaction of the international organization against excesses (corps-a-corps, running, violence, dangerous play, attacks with bent arm, lack of discipline, etc.) which trainers and masters complain of more and more, one has the right to think that the F.I.E. is satisfied with "conventional" fencing as it is practiced, and with the way it is directed. Why then should the officials judge otherwise than they do? However, it is evident that a certain laxness has set in, led by electric scoring. Though the rules have absolutely not changed, and on certain points they have even been stated precisely, one cannot deny that today's fencing differs more and more from yesterday's. It is possible that there may be a sort of tacit agreement among officials to leave the apparatus alone, in order not to seem to be nitpicking. If today an international official had the fantasy of strictly applying the rules, he would probably be rejected by the community (directors, colleagues) and pointed at as interfering with good directing; and, probably, stuck with the label they lately have hung on a candidate for national director at his examination: "too severe". 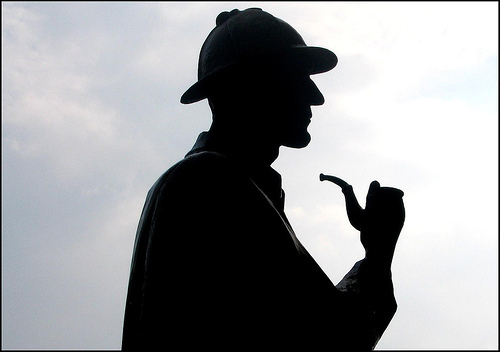 In the first analysis (or in the last, as you like), it is up to the F.I.E. to set things straight. For the following reason, the observance of the rules which should bring about an improvement in the game, making it more attractive, more spectacular, more comprehensible to the public, can only be achieved by starting at the highest level. It must set an example. The observance of rules can then proceed toward the lowest levels (where learning takes place), passing through instructors whose teaching must follow the rules. It is an illusion or, rather, a mistake to hope to reach a solution from the other direction. Everyone knows (at least among those who are familiar with the problem) that the young fencer copies the champion (often more than he listens to his master!) in what he does well, but also in his mistakes. These can run counter to or even destroy all that has been taught him. On another plane, that of morale for example, the non-application of the rules governing conventional weapons -- or an only partial application -- brings a considerable prejudice against correct fencers or against those who have been wronged. The essential reason is that in fencing every penalty is preceded by a warning, which has been subtly modified -- rendering it a little ridiculous, but certainly not more rigorous. In effect, our sport is the only one that tolerates errors without penalizing them immediately; errors that put one fencer at a disadvantage without any reparation. It is even possible physically to assault an opponent, in the course of a violent action which might send him to the hospital without being otherwise penalized than by a SPECIAL warning! In other sports, warning accompanies a penalty and precedes a more severe penalty in case of repetition; in fencing, the warning always precedes the penalty. 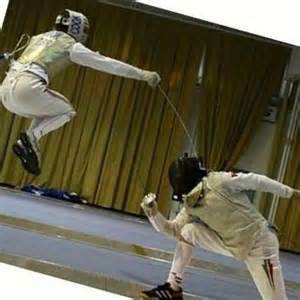 One could write a volume on the anomaly and the derision of fencing penalties, for they exist only in the books! The responsible people in the F.I.E. think they are doing their whole duty by adding one article to another, without supervising its application. For a good quarter-century, they have been playing this little game which is causing the spirit and the quality of conventional weapons to disappear. To take just one example, several years ago they added to the rules precise directives about the correct execution of attacks, in which the extension of the arm must precede the advancement of the foot. However, people continue to give right of way to an action forward, with the arm pulled back during its entire development, while along the way the opponent attacks "on preparation". We have been able to see this recently in the gala women's tournament at the famous "centenary" of the Federation. With such errors in directing, how are instructors supposed to teach? It is true that they are practically never consulted. Finally, to finish this chapter, it is perhaps not useless to dwell on one other aspect of directing which D.T.N Oprendek raises in his report on the 1982 world championships. This is the matter of certain high-level fencers conducting themselves toward international directors likely to be active in the course of competition with a sort of conciliatory behavior based on flattery, on admiring praise, to dispose them in their favor in case of need. Oprendek has used as reference in this type of seduction operation the former Olympic champion Drimba. In our salle ALL fencers are expected to be competent judges and director’s, and are trained to apply the rules strictly. Since we are not interested in “winning” by accident, all touches must be made clearly and distinctly enough to be recognized by the judges, and must occur in a clear phrase d’armes. No other hits are counted as touches. We also continue to count touches AGAINST the fencer who receives them, not in favor of the one who delivers them. We believe this helps to emphasize the importance of defense, and de-emphasize the importance of offence, leading to a more conservative, less aggressive and more realistic bout. Further, we IMMEDIATELY DISQUALIFY a fencer for ANY emotional displays whatsoever, while in the salle. The rude narcissistic conduct that seem to be in fashion among “sport” fencers would result in their expulsion from the salle and the annulment of any victories, prizes, etc that had won in that event. It is evident that in the past quarter of a century the nature of the game, the very character of conventional fencing, has changed. The fencer in general no longer presents entirely the same silhouette; his game no longer has the same clarity or evenness as before. Very recently, during a retrospective on Italian sport, rebroadcast on television, two fencers of thirty years ago were contending in a world championship final. Elegant bearing and position, displacements in measure with the strict minimum required by distance, practically perfect mastery and ease of movement, left arm in the air, rounded not to "look pretty" but for the role it has to play in balance, and respect for the rule which prescribes implicitly that the valid surface of the trunk must be unconcealed. It was hard not to compare this immediately with the picture presented by today's fencer, whose back arm -- its action denied and denigrated -- hangs down, most often between the legs like the trunk of an elephant, whose armed hand is everywhere and nowhere, and whose leg movements are wide and crazy leaps. The announcer gives the names of the antagonists: d'Oriola, Mangiarotti. Evidently it is another time, another fencing, even if combat still remains combat if the "rules of the game" are still exactly the same. Is this view of things personal, or is it shared by other personalities? To find out, let's let several fencers of different generations express themselves. Didier Flament, an active fencer toward the end of his career, declared "I think that referees must show themselves more vigilant and exacting toward fencers who tend to profit from their physical qualities, to the detriment of technicians respecting the true spirit (of foil)...This is no longer classic fencing, but sabre for boarding ships!" Thus, Flament regrets the disappearance (or the impossibility of doing) classical fencing, that is fencing "which does not depart from the established rules". Christian d'Oriola, Olympic champion thirty years ago, does not formulate a precise criticism, but he recognizes that "physical engagement is pushed more and more, especially among high-level performers." He estimates that one does not actually violate the rules, though one follows them a little "energetically", and thinks that by "armoring" the fencers a little more, one might protect them against accidents. J.Leal, in Figaro, is practically the only one, with Flament, to consider that it "is urgent to review the rules of directing, so that fencing does not become still more dangerous." Finally, I recall the already-cited opinion of Carlo Brusati, President of the F.I.E., international fencer before the last war: "Today's fencing is heavy, without style and without standards." It is well said. It is also an observation that coincides with our own. But M. Brusati has added an explanation to this state of things which will be appreciated in varying degrees by the instructors: "the masters and the instructors no longer require of their pupils the primordial quality of bearing the blade with suppleness, contrary to what was done in my day." People can, evidently, disagree; that is, furthermore, that people do won't stop us from continuing to fence. But what kind of fencing? Do we think to attract a vast public by showing it an often incomprehensible clashing of blades? People are too quickly satisfied by this excuse, which is beginning to lack originality: "The uninitiated don't understand anything because it goes too fast." That is not correct. Anyone can follow the play -- even very fast -- if the exchanges alternate. This is the very essence of foil. But no one can take any interest in it if the exchanges are simultaneous. Scientific deficiency in a spectacle has never unleashed enthusiasm. A beautiful attack, a lightning parry-riposte, a prolonged exchange, are understood by everyone. We are scarcely spoiled in this respect today! Electric scoring has meant a two-edged sword for fencing. It has brought a certain indisputable progress in the realm of materiality of the touch. It has also, unhappily, allowed foilists to risk unknown actions or, rather, actions impossible to accomplish in real combat (whence the rules and conventions stemmed): attack into the attack, double touches, simultaneous actions, or actions rarely attempted before: remises against direct ripostes, which partakes of poker. The electric scoring has allowed the sport of foil to break away from its rules and to put into use actions "not seen" or "not accepted" previously by a human jury. It is more precisely the excessive use of the counter-attack in all its forms which evolution has influenced. These actions have progressively gained on classic defense. At the same time there has arisen a new state of mind: a sharp watch for the moment to act -- before the opponent. Simultaneously -- alas! the mortal accident of Smirnov has shown it -- the intensity of training of modern champions, their physical strength, their speed, introduced into actions where the opponents are advancing toward each other, are added; sometimes these clearly exceed the norms of safety for fabrics and masks. The thrust into a thrust (long ago, they used to call it "the thrust of two widows") is, I believe, the most harmful, unfortunate, and also the most dangerous action in contemporary foil fencing. An unusual action formerly, it is now ancient in the minds of more and more fencers; it quickly reaches the minds of the young as soon as they enter competition...and God knows they start early these days! Can one remedy this, and how? In sabre infighting, the state of affairs is somewhat comparable, but less dangerous because the cuts (the most often employed) slide along the target, whereas frontal thrusts with the point break blades. The sabre has invented a procedure to reduce the number of simultaneous actions which were literally destroying the game. At a given moment, this system obliges one of the fencers "to forbid himself to provoke a simultaneous action." This method has been in use for several years, and it must be agreed that since then the technical quality of the actions has been improving. Perhaps one could get for foil a similar dissuading effect on simultaneous actions if, in an analogous case, one simply counted a touch against both fencers, as in epee: first, because the fencer on his mark would have an interest in avoiding these: then, because in case of tie at 5 in a pool, it could be decided as either a "nul" or a "double defeat", which is not advantageous to the two fencers. 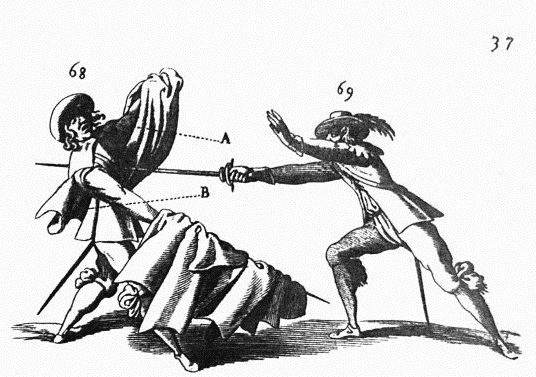 Finally, these new conditions of attack, which every fencer would confront, might perhaps provoke in the course of training at the salle a more careful study of hand technique: parries, ripostes, counter-time. 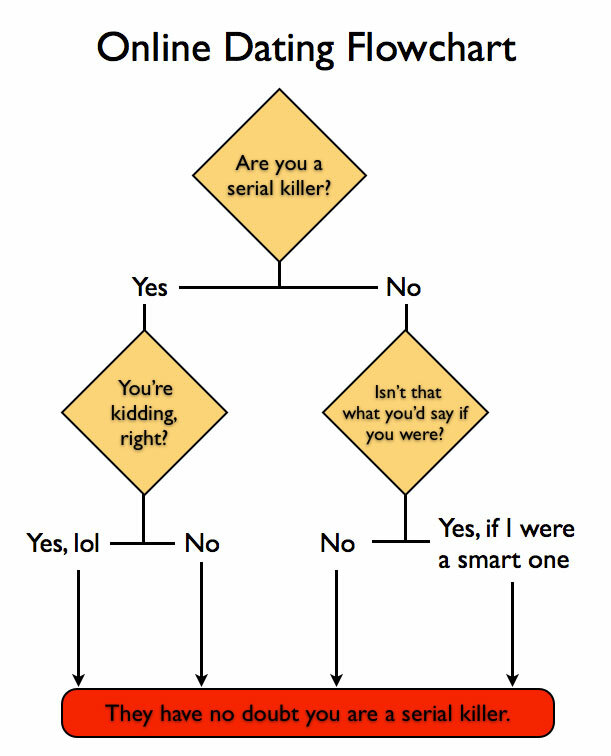 This is where we believe the cause of Smirnov’s death lies. The insanely aggressive manner of fencing – which can only exist due to incompetent directing – would be suicidal in the real world, but is homicidal on the fencing strip. When one fences defensively, as if the blades were sharp DISTANCE is extremely important. One does not remain in distance to be hit simple because one has first hit the opponent. Instead one must “strike and get out,” instantly breaking distance and parrying if necessary, a thrust coming from an opponent who may be mortally wounded, but way well live long enough to make it a double funeral. Only the most extraordinary mutual error should ever bring the fencers close enough to engage in a wrestling match. 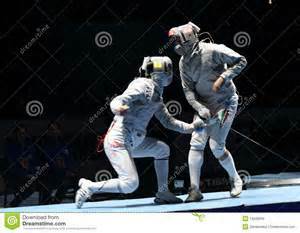 Today, a fencer charges in like a football player, hoping, not “to touch without being touched,” but merely to “touch before being touched,” because only the first touch will “turn on the light.” That is, the scoring machine artificially protects the stupid fencer from receiving his opponent’s answering thrust. We require that the fencer do it himself/herself. 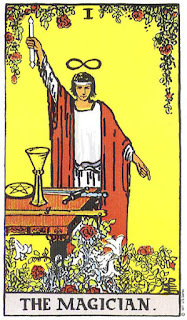 In our salle, one is expelled for any conduct that is dishonest, discourteous or dangerous. Off-balance and out of control. As is seen, the accident that cost Vladimir Smirnov his life can have useful consequences if it leads us to reconsider all the problems that concern the classic weapon. This would constitute a homage to him. • The study, manufacture, and utilization of a newly-conceived material assuring maximum safety to the fencers. A simplification of the code of penalties. Suppression of prior warning for faults in combat. Strict application. • Creation of a body of directors, competent, independent, supported, oriented toward strict respect for the rules, subject to yearly reappointment. • Attentive research and elimination of dangerous actions, harmful to safety and to the technical and spectacular quality of fencing. • Periodic consultation between the directing body and a teaching commission, to reach a unity of fencing doctrine. • Establishment of a code for organization and discipline at fencing meets. Research and elimination of "lost time" which makes competitions long and wearying for all. The "next" bout must go on the strip within as brief a lapse of time as possible. Today, we must call the fencers, sometimes hunt for them, wait for them to get dressed, to get hooked up, and for them to consent to say they are ready. Tennis, for example, records all dead time in order to prevent abuses. • Simplification and reduction of the composition of the directoire technique, at present too important, too slow, and too hesitant. Very inferior to that of tennis, which is run by a single man, a supervisor, who settles all disputes on demand, in the minimum of time, with an indisputable and undisputed authority. It is certain that a profound reform of fencing is needed at all levels, and in all categories: officials, masters, fencers, directors. It is not normal that in half-century of two sports about equal in public favor, one -- tennis -- should have made the development that we see, and that the other -- fencing -- continues to mark time. Perhaps we might also make comparisons with equitation. There are reasons for that. It would be necessary to collect and discuss them to understand them. But let's end on an agreeable note, for we still have our defenders and friends. In a book dedicated to the memories of his youth (La Mansarde, Editions France-Loisirs), the great explorer and scholar, Paule-Emile Victor, has given two pages to fencing and to his maitre d'armes: "It is in a big windowless room, cluttered with cardboard cartons, boxes, empty sacks, it's there that my sister and I, once a week, took our fencing lessons. My parents thought -- with reason -- that this sport would develop precision and speed of reflexes, suppleness and firmness of muscles, and fair play...The maitre d'armes was called Andre Krestovozdvijenski, adjutant with the 44th Infantry (Lons-le-Saunier). He was an excellent instructor and very much the psychologist..."
It is comforting to read that! 2. The President must enforce the rules strictly and without exception, with “zero tolerance” for wild, brutal, unorthodox play. 3. Fencers must be trained correctly, both technically and spiritually. Every fencer must have a commitment to maintaining the integrity of the sword. Anyone who does NOT clearly exhibit that commitment does not belong in the salle d’armes and must never be permitted to take the strip, let alone remain on it.